Home › Stringed Instruments › Cello › Muspor 4/4 Cello ..
A small weight that attaches to the string and changes the resonance. Used to eliminate wolf tones. Need to experiment to find best string and position. 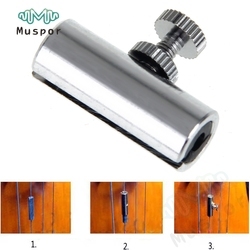 Easy to put on, just remove the inner lining and put it on the string, turn the opening and then slide the metal sleeve over it, tighten both the screw and the lock nut. Install Hole Diameter：1.5mm / 0.06"